As American Airlines has started to introduce a Premium Economy product to their international flights, I thought I'd give it a try on my next trip to San Francisco (SFO). 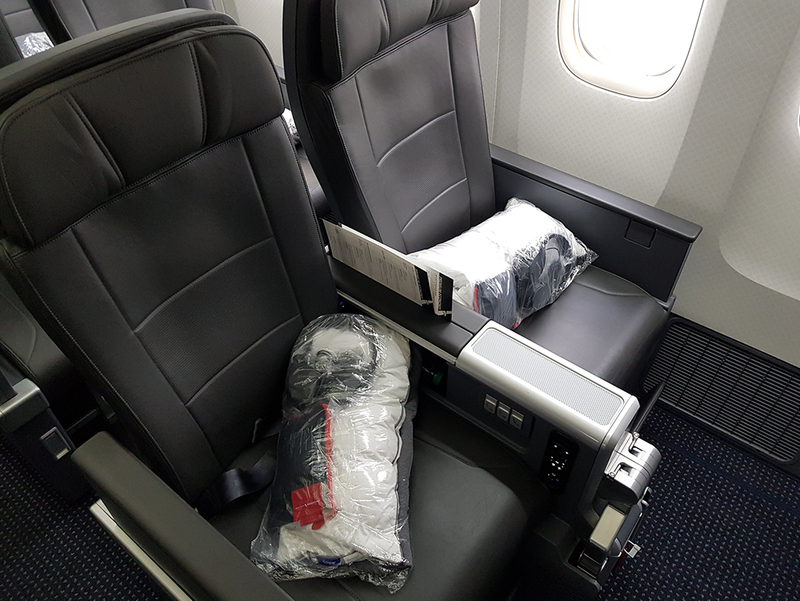 While I usually fly via London Heathrow (LHR), I was able to find a flight with the newly installed Premium Economy product on American Airlines via Dallas. This would allow me to thoroughly test the American Airlines PE product over the 11-hour flight from Amsterdam Schiphol (AMS) to Dallas Forth-Worth (DFW). As this was going to be a work trip, I looked into possible itineraries on Google Flights before proceeding to book this through Concur's abysmal interface. It's worth keeping in mind that I've come across some flights listed in Google Flights as having a Premium Economy (i.e. the 757), while they do not. As such, I'd highly recommend double checking the seat map on AA.com for the flight you intend to book to ensure it does have a Premium Economy cabin, not just Main Cabin Extra. 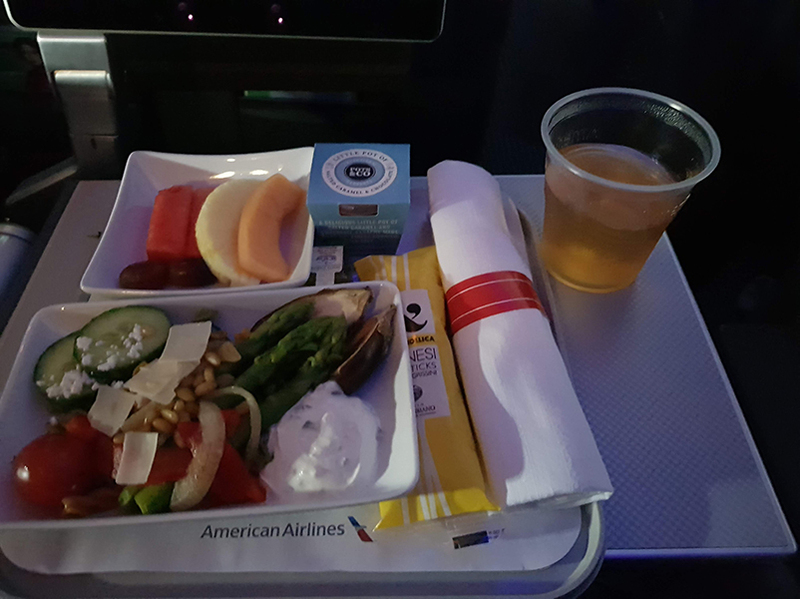 I ended up booking a British Airways (BA) codeshare onto AA221 (BA1630) from Amsterdam Schiphol (AMS) to Dallas Fort-Worth (DFW) in fare bucket T, Premium Economy / World Traveller Plus. After not being able to receive my boarding pass through the AA website or app, I got to Schiphol Terminal 3 and AA's check-in counters just to have a useless 'security interview', followed by receiving a boarding pass with the dreaded SSSS. My guess is that I was 'randomly selected' as a result of having BA re-issue the ticket 20 hours before this flight as part of an Avios upgrade on the return leg. On top of that, I was told we'd be departing from a remote stand and boarding through G gates (read: far!). After speeding through security and the border (thanks to Privium), I stopped by the BA lounge for a quick breakfast before starting the long walk to G19. Once I got to the gate it was an unorganized mess. While G19 is in an extension hall of G gates (which was closed), people just piled around the door. Once opened, there was no organization, with one gate agent contradicting the other, quickly frustrating many frequent flyers who were looking for group boarding. After 30 more minutes of chaos, we finally made it onto a bus to the plane. Once finally on board the 777-200ER, things were starting to look up. Let's start with the seat, 13C - a bulkhead seat in the small Premium Economy Cabin. At first glance, the Premium Economy seats look very spacious, reminding me of the US domestic 'First Class' seats. There was definitely no need to wrestle for armrest space. The cabin only has 3 rows of seats, all laid out in a 2-4-2 seating arrangement, while Economy behind is a 3-4-3 layout. As such, I wouldn't recommend sitting in the 2 middle seats, as you'll always have to step over a fellow passenger to get out unless you're traveling with a family of four. Also, note the big box that houses the IFE screen when seated. This is actually quite inconveniently located, as you'll constantly be pressing against it with your leg. As such, I'd probably forego the bulkhead seat in favor of row 14 or 15. These rows also get a footrest that is attached to the seat in front, instead of a cradle like footrest. While the seat is important, so is the soft-product, the service on board. 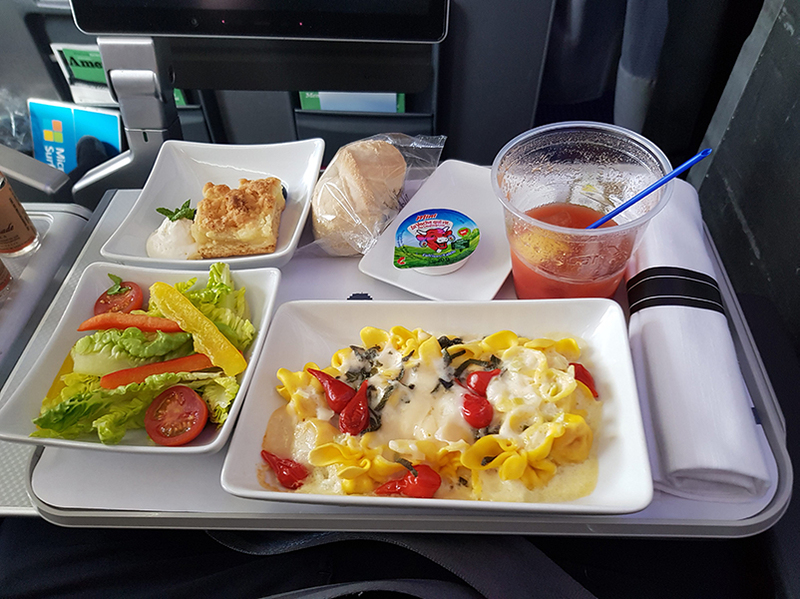 As this was going to be an 11-hour flight, the meal service consisted of 2 meals, with an (unannounced) ice cream snack between the 2. 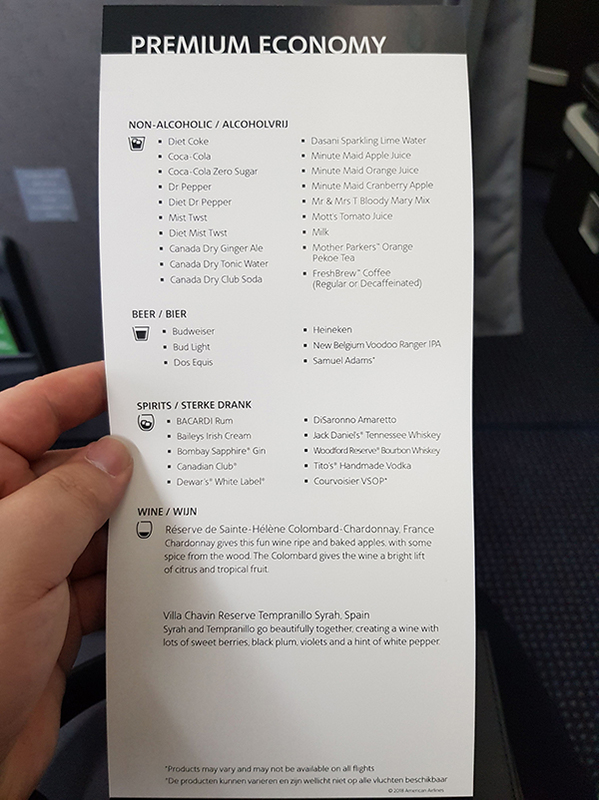 Much to my delight, unlike AA's economy product, it did include a full bar service! 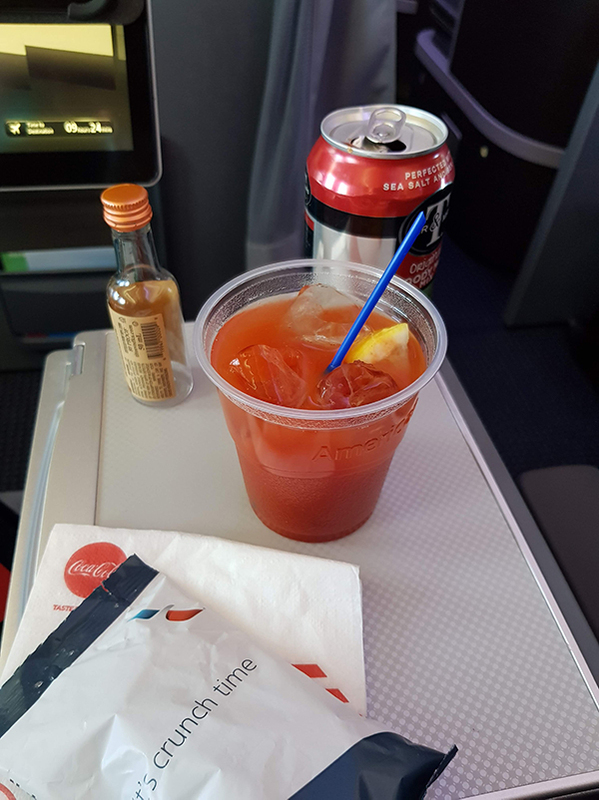 Around 30 minutes after take-off, the drinks service started, so I decided to go for a classic Bloody Mary. I have to say, I really enjoy American's Bloody Mary mix, which definitely makes up for the lack of Worcester sauce. This was quickly followed by the main course, where I ended up choosing the pasta. The meal was actually very good and a nice change from the usual beef dish I'm used to from BA. After the meal service, I decided to take a look at the amenities provided. AA has now partnered with Casper, to provide their blankets and pillows and I have to admit, it's working. 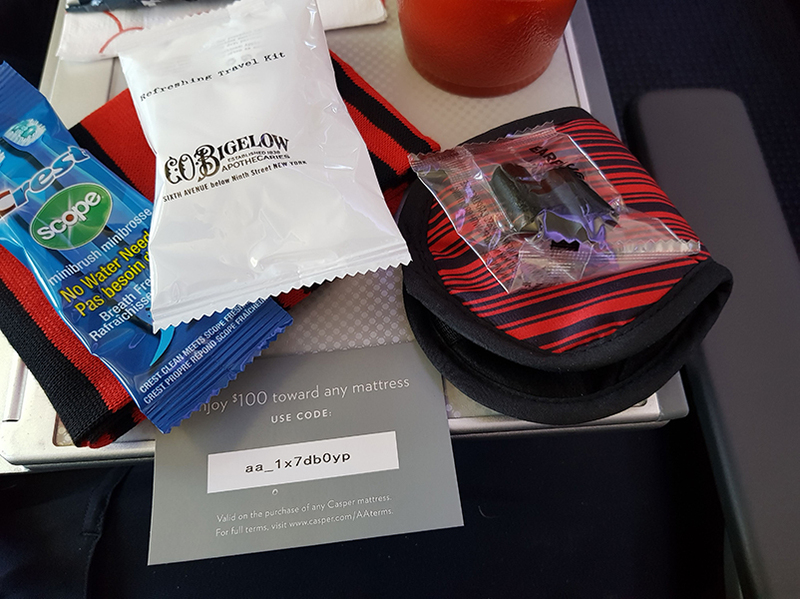 The pillow was one of the most comfortable pillows I have ever had on a (premium) economy flight, providing perfect support for my neck. Besides that, the amenity kit was quite standard. The only frustrating thing was that the lip balm was actually pretty much empty, which was a bit of a shame. Also interesting to see how AA's partners on this are using this as an opportunity for marketing. As the meal service was now finishing, the mood lighting dimmed and most people went to sleep, except for one obnoxious person in business class who left his blinds open which meant the cabin was still relatively bright. About 1.5 hours before landing, the lights came back on and it was time for the second meal. 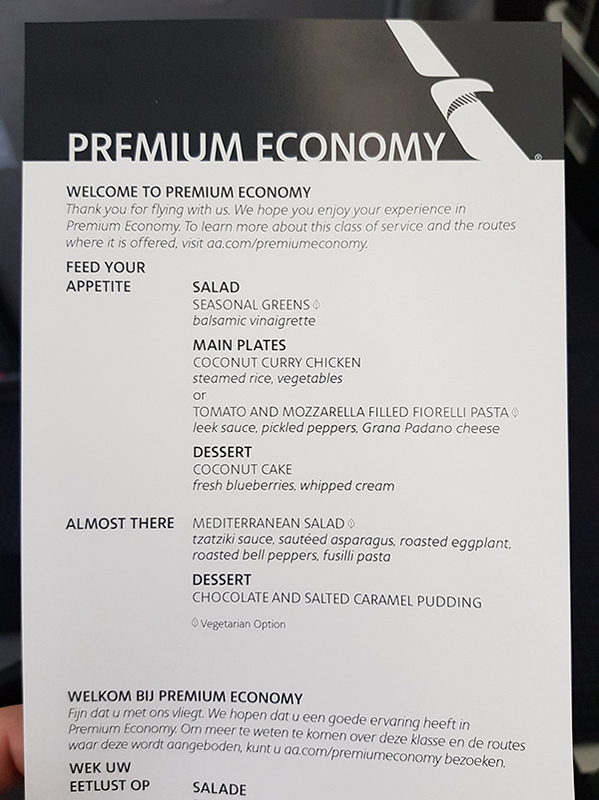 Again, I was pleasantly surprised by the meal quality, which is definitely superior to the catering on BA, especially given the second meal generally is just a warmed up wrap. Overall, I was massively impressed by the service on board. The meals were great and flavorful, unlike the often bland meals on competing airlines' Premium Economy product. The service was great too, with a very attentive and friendly crew, it was never a challenge to get another drink. The hard product is also nothing to be ashamed of. The seats are comfortable and the cabin overall feels very roomy. The only downside here is that in the bulkhead seats, the box to store the IFE screen is taking up a lot of space and feels a bit in the way. The only downside here was the service on the ground. 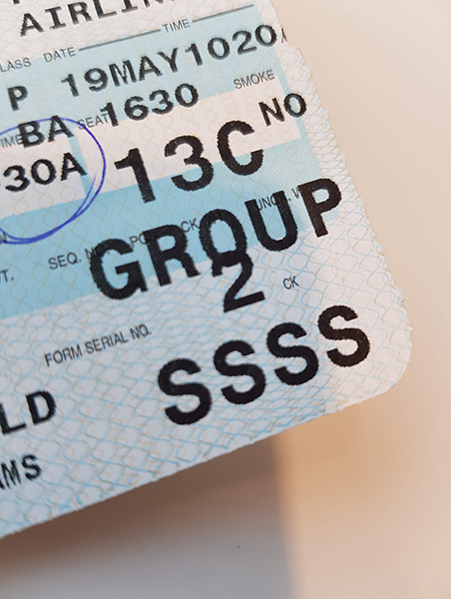 While I understand that online check-in would not have been available as I was being SSSS'ed, the ground services team at Schiphol was completely unorganized, giving passengers conflicting information when they were giving any information at all. Definitely, something that needs improvement. 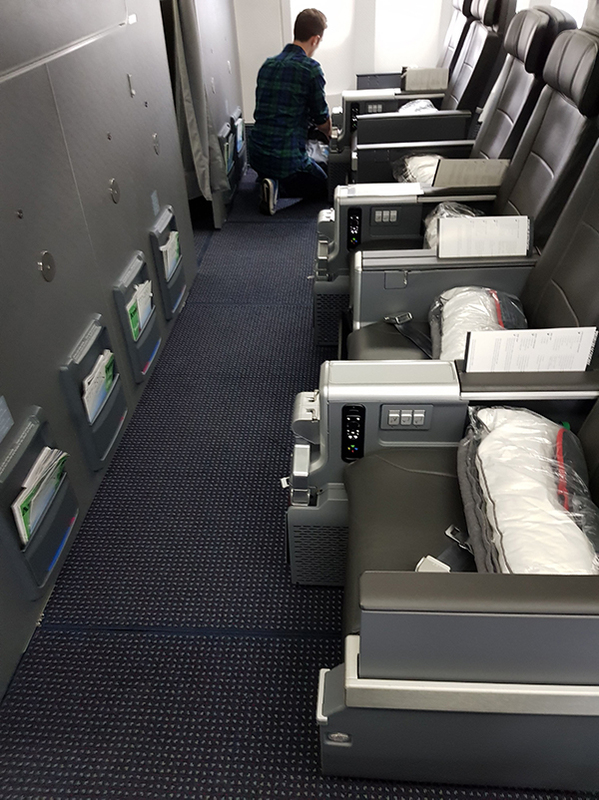 Overall, I'd choose American Airline's Premium Economy over the likes of BA's Premium Economy - especially on a day flight like this one, if the routing is convenient.